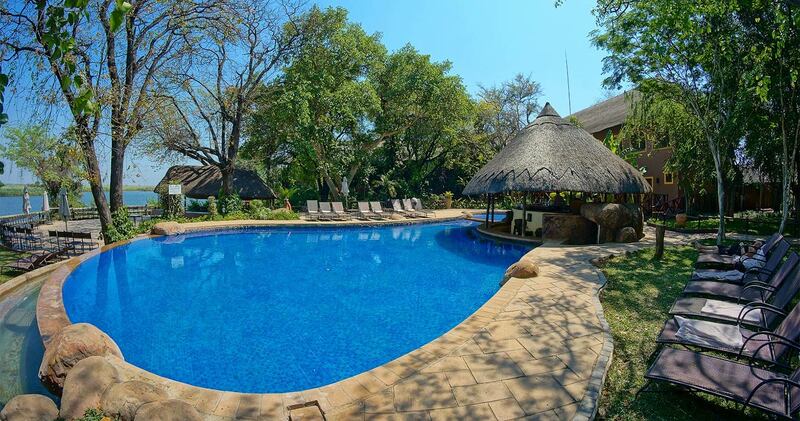 Situated in the north-eastern corner of Botswana, right at the edge of Kasane Town and just a short drive from Chobe National Park, lies Chobe Marina Lodge. Surrounded by landscaped gardens and located on the Chobe riverfront, Chobe Marina offers an ideal base from which to explore the area. From the minute you are welcomed with warm towels and a big smile, to the first time you take a dip in the spacious swimming pool or enjoy a breakfast with excellent river views, any tension will edge off and make room for relaxation, even just by soaking up the view over the lush expansive gardens surrounding the lodge. The gardens offer a safari experience at your doorstep, since they are home to an abundance of wildlife, including the legendary fish eagle, warthog, squirrel, mongoose, vervet monkey and fruit bat. After unwinding from our fast Western pace at Chobe Marina Lodge, a trip to world-renowned Chobe National Park lasts a mere ten minutes. Prepare yourself for many encounters with Africa's famous foursome - elephant, leopard, lion and buffalo – and many other animals. Isn’t that just why you came here? Accommodation at Chobe Marina is provided in thatched studios, apartments, chalets or suites, of which there are sixty in total. 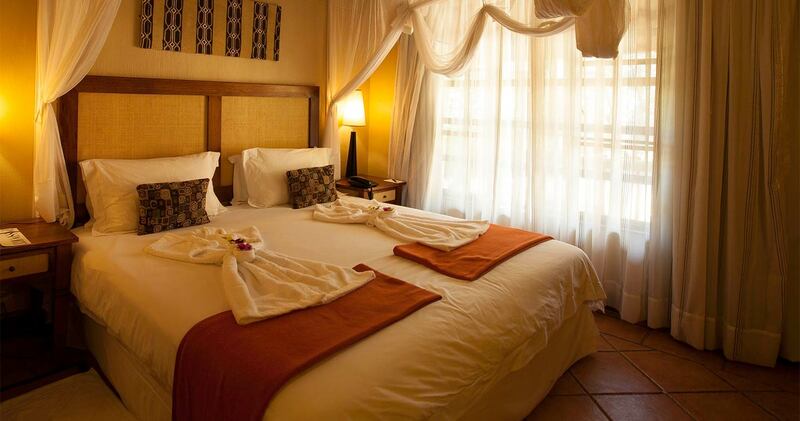 All the comfortable rooms offer king or twin beds, mosquito nets and mosquito repellent, en-suite bathrooms, air-conditioning, ceiling fans, hairdryer, select satellite television channels, tea and coffee making facilities and minibars (stocked on request). 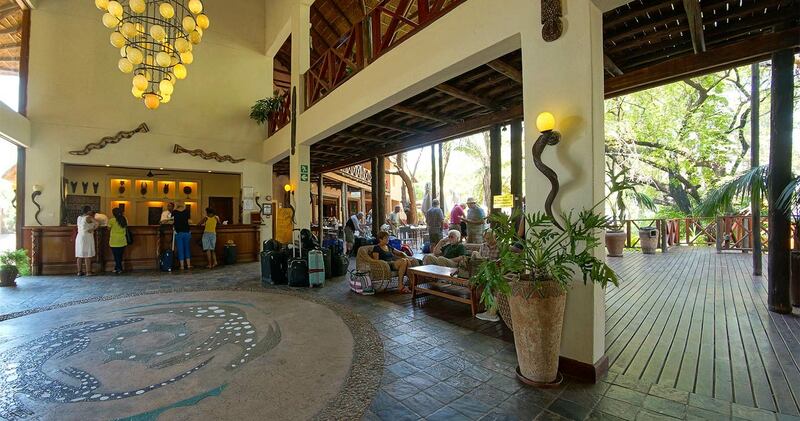 For socialising and swapping safari stories, nestle down in the cosy communal areas that boast amazing views. There is a riverside dining venue called Commissioner’s on the first floor for gourmet nights. For more casual and homey meals, breakfast, snacks and light lunches are served at the Mokoros Family Restaurant. There is an amazing poolside bar with great cocktails and a large swimming pool. 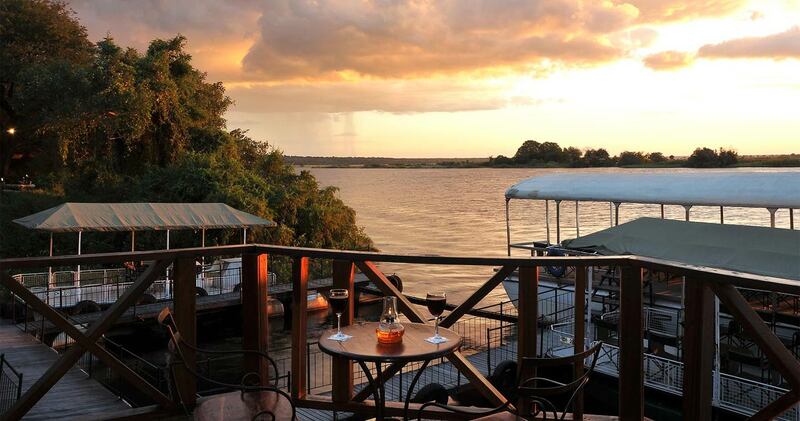 At sunset, get a first-row spot at the riverside bar with views across Chobe River. And did we mention the on-site wellness spa with an extensive menu of treatments? All the activities offered at Chobe Marina Lodge might feel a bit overwhelming at first: there is just so much to pick from. Very few people will visit the Chobe area without taking a cruise down the famous river. Or even better: a sundowner cruise. Watch the sun set slowly on the horizon, with great cocktails and snacks on hand. Game drives are another excellent way to spot wildlife. If you allow yourself adequate time here – please, no rush - you will probably see nearly all the major species, such as: giraffe, elephant, zebra, impala, tsessebe, roan, sable, wildebeest, kudu, buffalo, waterbuck, warthog, and the predators that hunt them, including lion, hyena, jackal, bat-eared fox and possibly even cheetah and wild dog. And for all anglers out there: why don’t you try your hand at reeling in the famous Tiger Fish? A strong, freshwater fish, considered one of the top game fish in the world. Sore muscles after pulling out this heavy fish? Or just in immediate need for some pampering? Book yourself a treatment at the Cathari Health & Beauty Spa. In the hands of these professional beauty therapists, you will easily unwind and let tranquility pour over you. After that, all there is left to do is find your way to the gourmet restaurant; the Commissioners à-la- carte restaurant serves world-class dishes prepared by a highly skilled team of chefs. Pour yourself another glass of red wine, look up to the stars and you can’t help but be enchanted by the magic of a Chobe safari. All our expectations were fully met, well serviced rooms, great meals, extremely efficient and friendly staff. Highly recommended. The trip on the Chobe was fantastic and our organized trip to Vic Falls was truly spectacular. I really loved this place. Wow! I can't wait to return. The guides and activities were awesome. The food was excellent. The views were awesome. The room was great. The laundry service is very reasonable and efficient. I can only say the best things about it. Will use again! There is a beautiful golf course in close proximity to the lodge. Read all about travelling to Chobe Marina Lodge on our getting to Chobe page. Children of all ages are welcome at Chobe Marina Lodge. Children 0 - 5 years stay free of charge when sharing with 2 full paying adults. Children 6 - 11 years sharing with 2 full paying adults pay 50% of the adult rate. Families will 2 adults and 2 children will be required to stay in suites. Children 12 years and over are charged the adult rate. Two children occupying their own room or interleading room, will be charged adult single rate for 1 child only and FOC for 2nd child on a room only basis. We hope you have found all information needed to decide that Chobe Marina Lodge in Chobe National Park is the perfect place for your next travel adventure. Please fill in the contact form and we will get back to you soon!